Inihaw na Saging na Saba (grilled plantain or cooking banana called Saba in the Philippines) refers to a Filipino snack made of Saba, a cooking banana variety, peeled and skewered and cooked over charcoal. It is made of half ripe banana, when the banana is still a bit unripe and still a bit tough and not so yellow and overipe. Inihaw na Saging na Saba is often found in the Tagalog- speaking region of the Philippines, like Laguna and Marinduque. 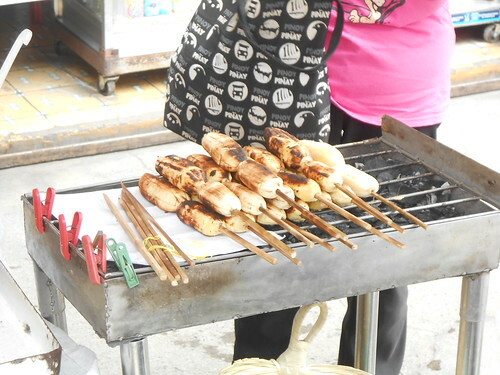 They are sold as street foods. Some said that this is a boring snack compared to other Filipino banana snack, like Turon at Minatamis na Saging with milk and shaved ice, but I learned to like it, with just enough ripeness and sweetness, I think this is a healthy snack option. Maybe I enjoy eating Inihaw na Saba because it reminds me all the time of my summer vacations in the home province of my mother where my grandfather lived until he died. It was my grandfather who bought the first Inihaw na Saging na Saba which I ever tasted while walking along the beach in Torrijos, Marinduque. In San Pablo City, Laguna where I kept a home, there are lots of vendors selling “inihaw na saging”. I have not eaten Inihaw na Saba for a long time now, I have not found Saba in Germany, only cooked and packed boiled Saba imported from Vietnam in my favorite Asian store in my city, but there is nothing quite like our Inihaw na Saba. Soon I am home, I hope to be able to find time to travel around my country and enjoy once again its great culture.